With many Kennebunkport hotels to choose from, our guests return to the Guest House year after year for many reasons. Affordable – We offer affordable rates for visitors looking for inexpensive and modest accommodations near Kennebunkport Maine and Kennebunk Beach. 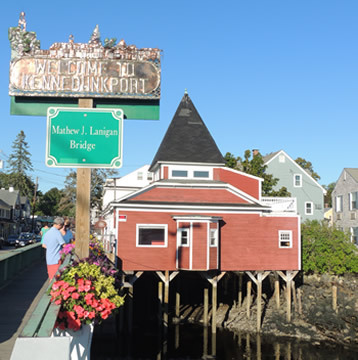 Location – We are only 1100 feet from the start of to things to do: Kennebunkport village, Dock Square, lovely shops, fine dining, casual restaurants, whale watching tours, kayak rentals. We are about a half mile walk to beautiful sandy Kennebunk beach, and 10 to 60 minutes driving of famous outlet stores, and state parks. A good place to relax – Simple, plain accommodations without a lot of hustle and bustle of a resort We are as relaxing as a bed and breakfast with in room amenities to provide the comforts of home. 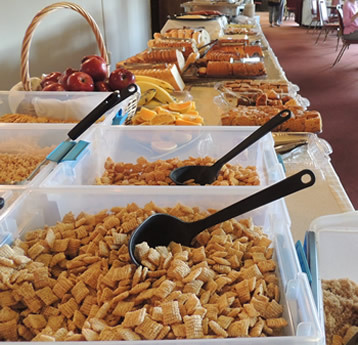 A little bit of Lithuania in Maine – In keeping with the owners Lithuanian heritage, taste homemade breads for breakfast and learn a few words in Lithuanian from our Lithuanian summer staff and Lithuanian guests. Surrounded by beauty – Enjoy the tree lined walk to the beach, the riverside paths and resting spots, and the Frederick Law Olmsted Bros designed grounds at the nearby Franciscan Monastery. Transportation: We are about 90 minutes by car from Boston! – And only about 40 minutes from the Portland Jetport and 15 minutes to the Well’s Maine Amtrak station.